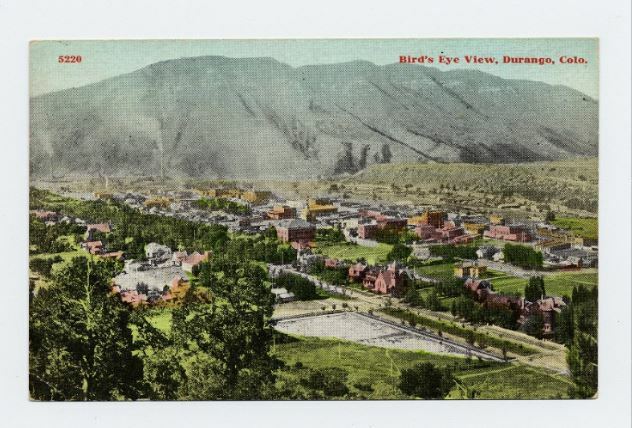 Bird’s-eye view of Durango, circa 1907-1914. In today’s world of social media and instant communication, the postcard has become a lost art. But the basic idea is the same – the desire to share pictures and updates with friends and family while you’re apart. A century ago, postcards were a popular and cheap way to send a quick greeting. The United States first passed a law in 1861 allowing the sending of cards through the mail, and America’s first postcard was copyrighted that year. Postcards really gained popularity after 1907, when US laws began to allow the “split-back” postcard – the familiar postcard style with the address on the right and the message on the left. 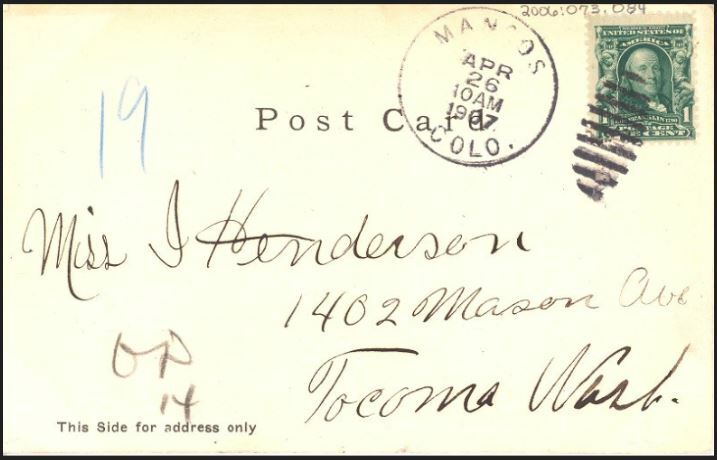 Prior to that time, messages were not allowed on the same side of the card as the address, meaning most postcards were simply a picture on the front and the address on the back. Postcard styles evolved over time, but their popularity began to decline around the 1990s. 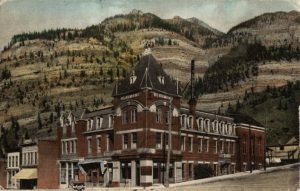 During the heydey of postcards, senders all over the country could choose from a variety of pictures of notable local buildings, parks, scenery, or streetscapes. Some picture postcards used actual photographs, while others featured illustrations done from photos. Postcards have become amazing historical resources for two reasons: one, if they contain messages, we’re provided with a glimpse of everyday life in the past, and two, the postcard images are a unique view of scenes of the past – especially the illustrated color images from before the days of color photography. They highlight the places that the city, town, or area believed to be important, the buildings they were proud of, the natural wonders that excited viewers. It’s little wonder that postcards are a popular collector’s item today. 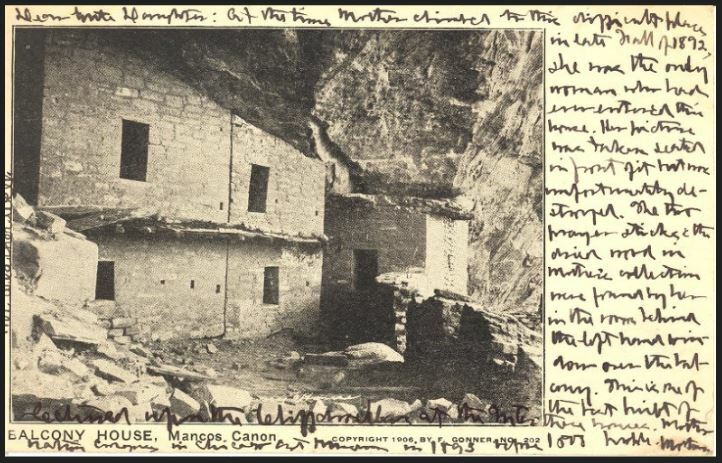 If you’re studying the history of Southwestern Colorado, postcards are a great way to to peek into the region’s past. The Center for Southwest Studies at Fort Lewis College has digitized a large collection of postcards from places like Durango, Mesa Verde, Silverton, Telluride, Ouray, and other locales, along with a number of postcards from the area’s narrow gauge railroads. Postcards also featured significant local events, like the 1916 Durango blizzard. Beaumont Hotel, Ouray, circa 1907-1914. 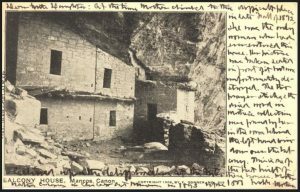 In 1925 – during an era when postcards were especially popular due to the growth of automobile tourism – the State Board of Immigration published Colorado: The San Juan District, which is available online from our library. This illustrated booklet makes an excellent companion piece to the postcards because it provides context for the places and people of the southwestern Colorado counties. Geography, climate, industry, history, natural resources, education, transportation, businesses, and tourist attractions are described for each of the seven counties in the region, accompanied by photographs. Search our library’s online catalog for more resources on the history of southwest Colorado. just before “split-back” postcards became legal.